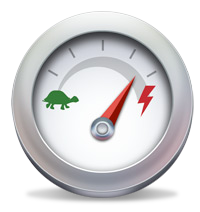 This speed test will check your ping time, Jitter, download bandwidth, and upload bandwidth. You are using a Mobile Device! Test your mobile speed, wherever you may be. Download the free Ookla Speedtest App for iOS, Android, and Windows Phones. If you have questions about what any of the terms on this page mean, see our Internet Glossary below. The transmission speed or throughput of your connection to the Internet. Measured in Kbps or Mbps (56Kbps, 1.4Mbps for instance). (Dynamic Host Configuration Protocol). A server in a network or Internet service that assigns IP addresses to the multiple stations on the network. A DNS server lets you locate computers on a network or the Internet by domain name. The DNS server maintains a database of domain names and their corresponding IP addresses. The link between two network/Internet nodes or network devices. Typically, an IP packet travelling from coast to coast via the Internet can "hop" through more than a dozen routers. The address of a computer attached to a network. Every client and server station must have a unique IP address. IP addresses are written as four sets of numbers separated by periods; for example, 64.29.193.182 (PC Pitstop's address). An expression of how much time it takes for a packet of data to get from one designated point to another. In some environments latency is measured by sending a packet that is returned to the sender; the round-trip time is considered the latency. Ideally latency is as close to zero as possible. A common Internet utility used to determine whether a particular IP address is online by sending out a packet (block of data) and waiting for a response. A device that forwards data packets from one local area network (LAN) or wide area network (WAN) to another. A router sends the packets based on the most expedient route (traffic load, line costs, speed, bad lines, etc.). An Internet utility that traces the route from the client machine to the remote host being contacted. It reports the IP addresses of all the routers in between. Internet bandwidth is, in simple terms, the transmission speed or throughput of your connection to the Internet. However, measuring bandwidth can be tricky, since the lowest bandwidth point between your computer and the site you're looking at determines the effective transmission speed at any moment. The tests referenced on this page address the first issue, and measure the Internet bandwidth between your computer and PC Pitstop's servers. We also have tests that can measure the round-trip time between your computer and seven different sites on the Internet, here. The differences between our Download and Upload tests aren't as obvious as they may initially seem. Yes, the basic difference is the direction of the data transfer: Simply put, the Download test measures your connection speed for viewing Web pages; the upload test measures the speed for maintaining them--or sending data over your connection. However, the rated upload and download speeds may not be the same for your connection. Some connections, such as 33K and lower, are "symmetric," meaning the rated upload and download times should be the same. Other connections, such as cable modems and ADSL, are "asymmetric" (the "A" in ADSL stands for asymmetric). This means the upload and download times won't necessarily be the same; upload times are generally not as fast as download times. For instance, the rated speeds for ADSL are 1.4Mbps down, and 400Kbps up. Cable modems are typically rated at 1.5 to 3Mbps down, and 400 to 600Kbps up. Occasionally, you may even see opposite results, especially on cable modems during the evening hours. If your connection has a heavy user load, the download times may suffer, while the upload times remain unchanged. This is because the majority of Internet users download data instead of uploading it. Bottom line: You should regularly run our bandwidth tests to make sure you're getting the rated upload and download speeds from your connection. You will often see bandwidth and transfer speed quoted in two different units: kilobits per second, abbreviated kbps or Kb/s, and kilobytes per second, abbreviated KB/s. The difference between the two units is the number of bits in a byte, which is 8. The small 'b' stands for bits, and the big 'B' stands for bytes. Transfer speeds are often shown in KB/s, and connect speeds are usually quoted in Kb/s. So, for instance, if a progress dialog for a modem shows you a download speed of 4.3 KB/s, it is the same as 34.4 Kb/s. If a progress dialog for a cable modem shows you a transfer speed of 100 KB/s, it is the same as 800 Kb/s. We display our measured transfer speeds in Kb/s, to make them easier to compare with your rated line speed. This is especially true with modems. Most 56Kbps modems connect at a speed less than 46Kbps, because of the limitations of analog phone lines and telephone company switches. Bandwidth over a modem connection can sometimes be difficult to understand. There are two connections to a modem: one from your computer to its modem, and one from the computer's modem to the ISP's modem. The connection speed between the computer and its modem (called the Maximum speed under Control Panel/Modem/General tab/Properties) should be set as high as possible without causing errors. On most computers this is 115200, also written as 115.2 Kb/s. The connection speed between your modem and the ISP's, and the compression and error checking, are negotiated between the two modems when they establish the call. In the very best possible case, which is rarely seen, two V.90 (56 Kb/s) modems will be able to connect at 53 Kb/s with compression, and the compression on normal text transfer will average 50%, giving an effective transmission rate of 106 Kb/s. Very highly compressible material could be transferred at the maximum rate of 115.2 Kb/s. Incompressible material like ZIP files could be transferred at a maximum rate of 53 Kb/s. Our download test transmits an incompressible block of random text. The theoretical maximum transfer speed for this over a V.90 modem is 53 Kb/s, if there was no latency at all on the line--that is, if there was no delay between the times your computer asked for a packet, our computer sent it, and your computer received it. With normal latency, however, transfer speeds are reduced to roughly 85% of the maximum, which for a V.90 modem would be about 45 Kb/s. If your modem connects to your ISP at the more typical 44 Kb/s, then you can expect our test to report about 37 Kb/s on a connection with normal latency.